Glasgow, Dundee, Alness and Greenock among the latest locations to benefit. BT today announced it is creating about 145 new apprenticeship and graduate jobs in Scotland in its drive to equip young people with the skills and training needed to meet the challenges of a changing jobs market. The majority of the posts are for apprentices, who will be recruited in locations across Scotland, including Glasgow, Dundee, Alness and Greenock. Around a dozen graduates are expected to be based in Glasgow, Dundee and Edinburgh. This year’s BT apprentice and graduate recruitment, which includes mobile operator EE, will see the new employees work in a variety of roles, ranging from customer service and vehicle maintenance to cyber security and software development. A number of the recruits will be based at BT’s world-recognised labs at Adastral Park, near Ipswich, in Suffolk. This research centre is at the forefront of developing communications networks and is playing a leading role in the development of ultrafast broadband and 5G. The company also funds and runs Barefoot Computing, a project that helps primary school teachers get confident with teaching computer science. One million children, including more than 45,000 in Scotland, have already been reached via the programme, which sees primary school teachers provided with resources and training, and BT plans to reach five million UK children by 2020. Gavin Patterson, chief executive of BT, said: “Young people today need three basic skills – reading, writing, and tech know-how. BT is investing in the next generation, helping to train primary school teachers to teach computer science and recruiting large numbers of apprentices and graduates. This is the right thing for us to do if the UK is to remain a digital leader. BT is one of the UK’s largest employers with 81,400 employees. According to a recent report by Regeneris Consulting, the company supports around 12,600 jobs in Scotland through direct employment, spending with contractors and suppliers and the spending of employees – and gives an annual boost to the nation’s economy worth more than £1 billion. Openreach, BT’s local network business, will launch its own recruitment drive in due course. Laura, 24, helps maintain the heating in BT’s buildings all over central and west Scotland, but can be called out to service boilers anywhere in Scotland. She’d had a variety of jobs before, from flipping burgers to business administration, but when she was 21 she gave up her full-time job to work as a club rep in Cyprus for three months. When she came home to Glasgow, it was time for something new. Laura said: “I have known people to go to university for years and at the end of it they’re fully qualified on paper but have no hands-on experience. I wanted to gain that experience and get a qualification at the same time. Through an apprenticeship, you learn as you go. “You learn a lot of different skills – practical and communication skills, working as a team, great customer service. I’ve done lots of training courses, met loads of different people and got involved in things like fund raisers and organising events… the list goes on. “As a combustion engineer is a very male orientated role, I love that I had the chance to show that woman can do the exact same jobs as men and to encourage more woman to join the engineering industry. 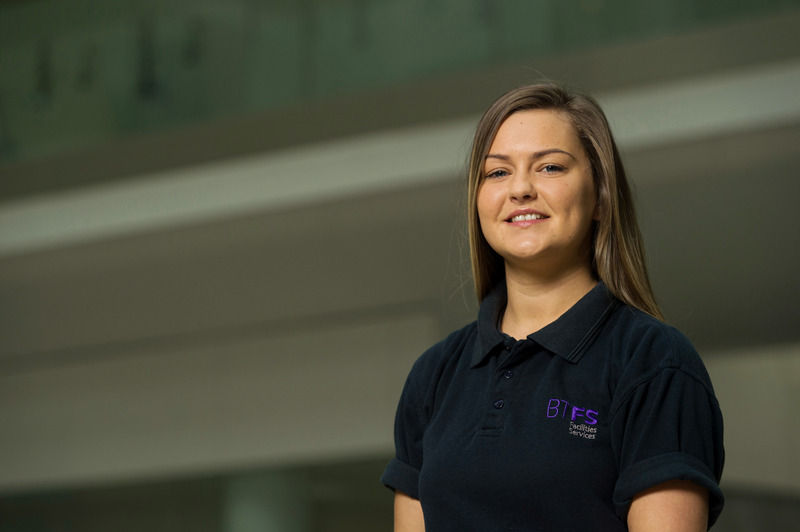 Both Laura’s sisters also work in different parts of BT and she had completed work experience with the company aged 16, so when the chance of an apprenticeship came up she couldn’t wait to apply. Laura added: “I was inspired to join BT by my sisters who really enjoy their jobs and have had lots of opportunities to grow and develop their careers. I’d met lots of good people when I did my work experience with BT and felt like it would be a welcoming place. When I heard I’d got the job I was over the moon.